If it happens that you are looking for Customer Relationship Management software, you will find out that one name comes up now and then: Salesforce. In every article or video you watch, they will mention it at least once. However, why? Just put: Because Salesforce is king. When it comes to Customer Relationship Management (CRM) Software, Salesforce indeed rules the field. The app is the definitive CRM leader with an estimated $40 billion market capitalization. The company has over 100,000 customers and revenue that exceeds $3 billion. Why is that so? Due to Salesforce offers everything. The company offers various products that are built on core functionalities such as Contact Management, Lead Management, Salesforce Automation, Marketing Automation, and reporting and analytics. Salesforce also offers a feature called AppExchange which offers numerous add-ons and industry-specific solutions that have been proved to be very helpful for what they were designed to do. SEE ALSO: HubSpot Vs. Salesforce 2018 Comparison: Which is Right for Your Business? Why do businesses use Salesforce CRM? To use the Sales Performance Module to set metrics-based goals and highlight winning performances of sales representatives to encourage healthy competition in the team. Salesforce products are all cloud-based and offered on a per-user, per-month subscription (paid annually) basis. However, being feature-rich software also has a negative side: You are paying for features you are not using. If you are a small business, then you do not need all those features that come with the software. Also, with a starting price of $5/user/month, the software is not cheap. Add this to the fact that small businesses do not need as many features as larger businesses, and you will find that you are paying more than you need to. For these reasons and more, Salesforce could be the wrong software for your business, or at least, and there could be an option out there that better-suits your needs. That's why we are going to give you a look at the best Salesforce Alternatives to see if any of them could work better for you. Pipedrive is high-quality software that’s top-rated for its high-quality sales pipeline management features as well as its robust suite of useful tools. Professionals for professionals designed the system. With that being said, setting up the program and starting to use it is a quick, easy, and painless process. Pipedrive can organize your business leads with efficiency so you can get a good view of your sales and be able to focus on priority deals. Pipedrive is entirely mobile optimize. Put in simpler words: it is designed so it can be used by your sales teams anywhere – helping them to be more productive in the field. The solution integrates with Google Apps smoothly and can integrate with other leading third-party business solutions as well. Pipedrive’s pricing packages are flexible enough to suit businesses of all sizes, and they offer a free trial so you could try out the critical features for yourself first to see if they satisfy your needs and meet your requirements. Pipedrive is best-suited for companies that focus more on their sales effort and are more concerned with closing deals than with customer follow-up after the agreement. Example of such type is real estate companies. Small businesses need CRM solutions too, and Insightly is an online CRM solution that made with small businesses in mind. Small businesses primarily use it, and currently, used by more than 500,000 users around the globe. The solution does offer specific, enterprise-level modules for larger companies and multi-level organizations and businesses, in any case. Insightly offers a range of features, including task management, pipeline management, and contact management. These features are designed to help you get clear sales visibility and a good overview of how your operations are going. You can also use it to track deliverables to clients, improve collaboration among team members, boost customer satisfaction, enhance efficiency, and accelerate productivity. It is optimized for iOS, Android, and Kindle mobile platforms so that team members can use it on-the-go. The app also integrates smoothly with popular solutions such as Office, Outlook, Evernote, Google Apps, and MailChimp. This plan gets you, two users, ten emails daily, 2,500 records, ten custom fields, 200Mb of storage, and online community support. You can try it out here, no credit card required. This plan gets you 500 emails daily, 2,500 records, 50 custom fields, 1 GB of storage, Mobile app business card scanner, onboarding sessions, and email support. This plan gets you 10,000 emails/day, 500,000 records, 1000 custom fields, 250 GB of storage, mobile app business card scanner, onboarding sessions, and priority email support. Nutshell is a smart CRM solution designed to help sales reps gain more success, and best suited for small businesses as it empowers them to win more deals in less time. It integrates with favorite 3rd party apps and services such as Microsoft Office, Microsoft Outlook, and Gmail. You don’t need an implementation consultant or CRM administrator to start using the app, and you also don’t need more than 24 hours to get started. The app’s provider offers onboarding assistance and free customer support to help you start using the software. This package offers Pipeline tracking, Sales process automation, multiple pipelines, sales and forecast reporting, funnel reporting, Onboarding, dedicated customer success manager, quarterly business reviews, Live chat, email support, and phone support. Nimble is a popular CRM software with a simple relationship manager that gives insights to managers, so their companies can build better relationships in a multi-channel world. The app offers a smart way to track and engage business contacts quickly. As it was built as a Social CRM, the app connects with your email and social media accounts as well. Nimble provides a singular platform where you can find your contacts, calendar, collaborations, and communications. Through this platform, you can also get information from favorite social media channels such as Facebooks, Twitter, and LinkedIn. It will also link the info it brings from Social Media sites to your business contacts. One thing that makes Nimble special is the in-CRM message inbox that collects your emails with clients as well as all your interactions with them on Social media. The app also integrates with 3rd party apps and services such as HubSpot, AWeber, MailChimp, Constant Contact, Freshbooks, HootSuite, and more. You can easily import contact information from the email, Gmail, Outlook, Yahoo, Facebook, Google+, LinkedIn, and more. For $22/user per month, if billed annually (and $24 if paid monthly), you get up to 25,000 contacts and 2GB of storage. If you’re looking for an easy-to-use, cloud-based CRM solution that plays well with other software, Freshsales might be what you’re looking for. Freshsales captures leads, depicts where they are from and distributes, scores, and nurtures those leads via multiple communications channels. Freshsales also offers some advanced features such as call recording, call routing, auto-dialers, and affiliate management. The app also provides a revenue analytics tool where it can collect all pertinent source and rep metrics into accurate, attractive, and helpful reports. It also has a range of filters you can use to summarize your data so you can organize the results in any way you want. It also lets you create charts and tables quickly, make summaries with ease, and master matrix reporting in no time. The most basic plan and it gets you: Contact Management, Leads, Accounts, Email, Built-in phone, iPhone and Android Apps, integrations, and more. You can try it for free here, no strings attached. With this plan, you get: Contact Management, Multiple Pipeline Management, 500 Bulk emails/user/day, Built-in Phone, 5 Sales Campaigns/user, Lead Scoring, 10 Intelligent Workflows, Advanced Reporting, Integrations, iPhone and Android Apps, Territories and Lead assignment, and Advanced CRM customization. This is the plan that gets you everything they offer, which means you get: Contact Management, Multiple Pipeline Management, 2000 Bulk emails/user/day, Built-in Phone, 25 Sales Campaigns/user, Advanced Lead Scoring, 50 Intelligent Workflows, Advanced Reporting, Integrations, iPhone and Android Apps, Territories and Lead assignment, Advanced CRM customization, Auto profile enrichment, Reports Dashboard, Smart forms and event tracking, EUC Data Center, and IP Whitelisting. 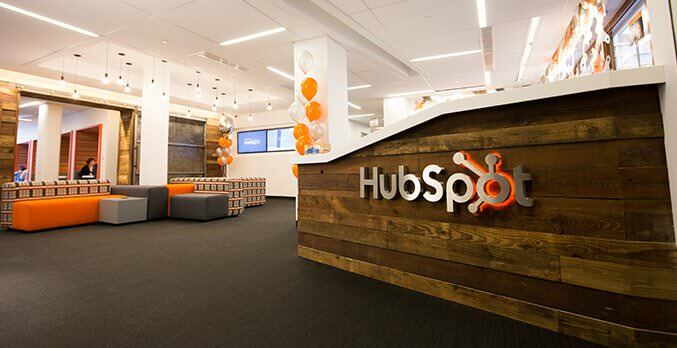 HubSpot CRM is one of the best CRM apps you can find on the market today. Why? It’s free, it’s simple, and it’s useful. It allows sales teams to start in no time with no need to change much of their already-existing workflow. The solution is ideal for companies which are just beginning to recognize how vital CRM is for their business and want to try it out. It’s also scalable and can be used for enterprises that want to use CRM to reach their fullest potential. HubSpot CRM offers users all the essential features you can find in other CRM solutions but without the confusing complexity that often come with it, and this makes it perfect for beginners and mid-market companies. HubSpot can neatly organize all of the customers’ communication with your business, so no single details are lost. It can effectively assign and track your deals, control your agents’ performance, and track all the company’s activities. Have we mentioned that HubSpot CRM is a certified, premier Google partner? Yeah, and this partnership comes with all the sweet benefits you would expect. 3- Basic – Starts at $200/mo. Up to 3,000 website sessions/mo. 4- Professional – Starts at $800/mo. 5- Enterprise – starts at $2,400/mo. Zoho CRM is an excellent CRM solution designed with the goal of attracting, retaining, and satisfying customers so your business could grow and flourish in today’s competitive market. The core of the solution’s functionality is to lead and contact management. However, it also offers sales pipeline management as well as purchase control. Of course, it’s a given that the solution comes with the all the features you need to get the best results. If you are not familiar with a Zoho interface, you will be pleased to know that’s a beautiful and easy-to-use interface. The home screen includes ten different components, and you can customize the dashboard to have it look more business-specific. Zoho CRM is scalable; this means you can use it regardless of the size of your business. The solution automates daily business activities, tracks sales, and engages customers in different platforms. Likewise, its mobile platform allows you to work from anywhere. Zoho CRM offers a free edition with the basic features but is limited to only 3 years. It also provides several other paid packages to choose from. A free trial plan is available as well. 6- Ultimate - $100/user/mo. Billed Annually only. 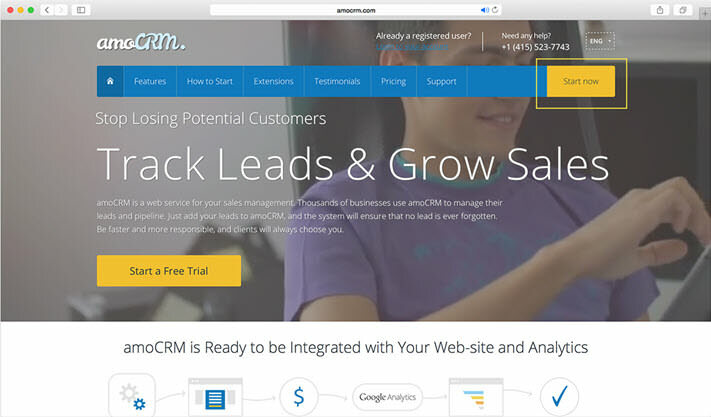 amoCRM is an easy-to-use CRM and leads and sales management solution that specializes in helping small businesses and sales teams in closing more deals and increasing their revenue. It’s created to convert your first-time contacts into leads, and then into customers. amoCRM maintains a centralized database to help with decision making, and it tracks your performance so you can stay on top of your progress and support your team do the best they can. amoCRM’s automated digital sales pipeline streamlines core progress like lead scoring and nurturing, email integrations, and performance is tracking through feedback and reports, among others. amoCRM is also cloud-based, so you don’t need to download or install anything on your computer. You also don’t need to be at the office to get things done or worry about updates or maintenance at all. The interface is similar to that you can find on social networks, so it will feel familiar to everyone (because let’s face it, we are all on social media, one or the other). Automation is significant as it eliminates redundant, time-consuming, and error-prone manual processes. The solution does its best to balance functionality and usability, and we would say that it is successful in doing so. amoCRM offers 3 pricing packages, and all include a 14-day free trial so you can try it out before committing. There are many other options out there. Remember, you can always find alternatives, and you can even find alternatives to the options. If you haven’t decided yet, maybe what you need first is to know how to choose? If so, take a couple of minutes to learn How to Choose the Right CRM Software for Your Business. Also, it’s always good to know where the market is going in the future, so why don’t you take the time to learn about the Tech Trends Driving CRM in 2018. As always, if you’ve found this article useful, Share it. And if you have any questions or comments, feel free to leave them below, and we will get back to you as soon as possible.